About 140 divers are attempting to create a world record for the longest underwater clean-up programme organised by Astro Kasih under its Corporate Social Responsibility programme, Beautiful Malaysia. This programme was officiated on Saturday by Chief Minister Datuk Seri Musa Aman together with Tourism, Culture and Environment Minister Datuk Masidi Manjun at Gaya Island. Also on hand were Senior Vice President of Broadcast and Operations, Astro, Rohaizad Mohamed and Vice President of Community Affairs, Astro, David Yap. The clean-up programme will be carried out for a week at 14 dive sites surrounding the Tunku Abdul Rahman Marine Park with the aims to create greater awareness on marine conservation as well as promote eco-tourism among Malaysians. Guinness World Record officials would closely supervise the 140 divers aged 21-63 from Malaysia, France, Australia, New Zealand, United Kingdom, USA, Lithuania, Switzerland, Hong Kong and the Netherlands whom would be taking turns to dive to collect rubbish underwater for 168 consecutive hours (night and day). 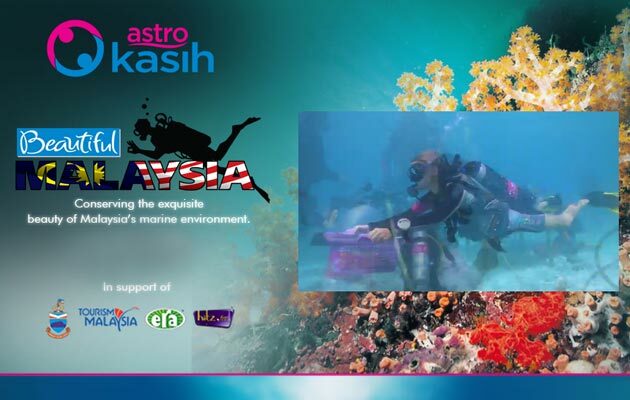 Astro Kasih has received an overwhelming response to participate in the underwater clean-up with over 700 entries from both local and international volunteers.